When I’m rarely but suddenly attacked by a chocolate craving, sometimes there’s nothing to do but give in. Since cheesecake is my vice, a decadent, creamy Chocolate Cheesecake was the way I decided to go. My cheesecake of choice is a soft and tender sort, so I prefer to add some ricotta cheese to it. Even though I’m in the mood for baking now and then, it’s nice to have options for a cake that takes hardly any effort. You know what? This is probably the easiest cheesecake in the world. 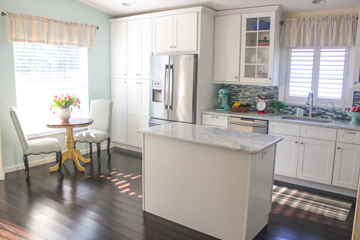 You don’t even need to use any electrical appliances and will have just a few dishes to deal with. 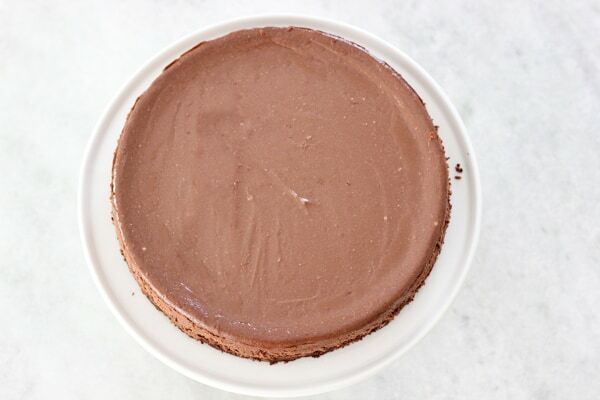 Even though this is a Chocolate Cheesecake, there is no finicky chocolate to deal with. That’s right. I have a confession to make. Sometimes I’m too lazy to melt chocolate, so in this case, I’m using cocoa powder. I can promise you that it tastes just as chocolaty and delicious, even without it, and most of all, you can have it in the oven in 20 minutes. That’s pretty great in my book. 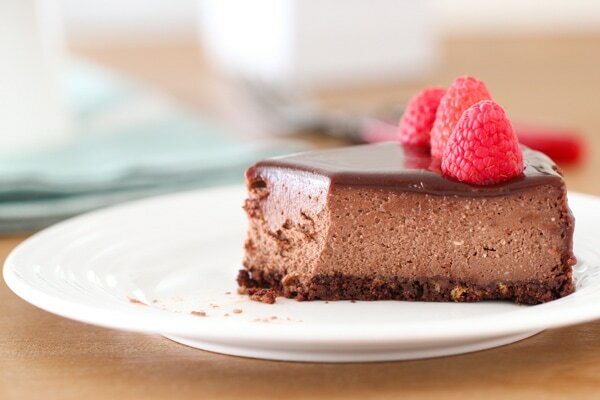 Most importantly, the velvety and luscious chocolate cheesecake will have you whispering compliments to yourself with every bite. Most likely you already have most of these ingredients on hand, so you can whip this up anytime. 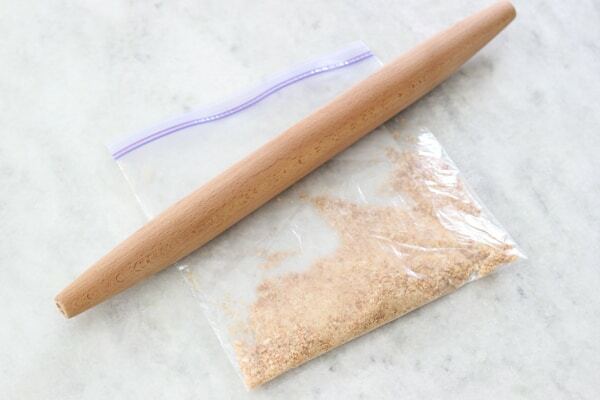 In a large ziplock bag, crush the tea biscuits with a rolling pin to get 1 cup of cookie crumbs. You can also use vanilla wafers or graham crackers. You can also pulse the cookies in a food processor. 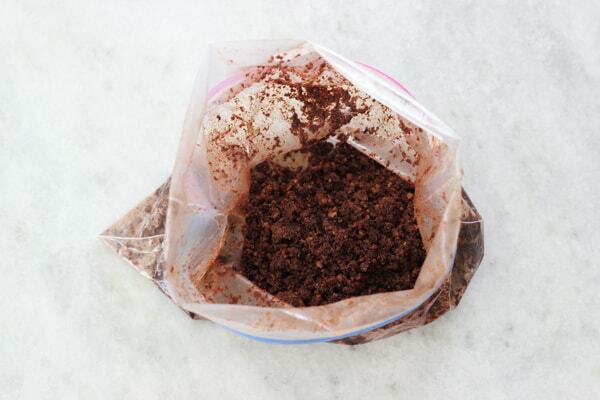 Add the sugar, melted butter, cocoa powder and salt to the ziplock bag, close and massage the bag with your hands to mix the ingredients together. (You can also add all these ingredients to the food processor and pulse a few times to combine.) 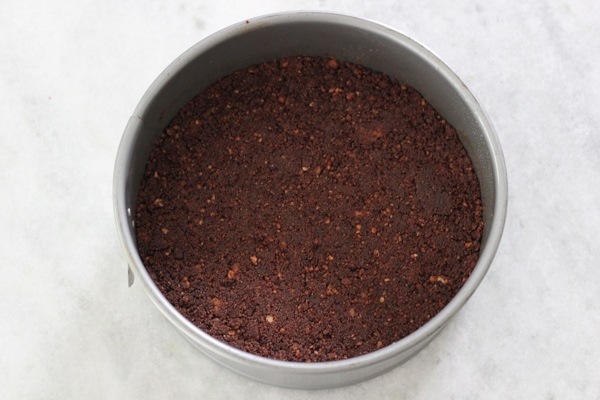 Press the crumb mixture into the bottom of a 9 inch round springform baking pan. If you want to make your crust come up the sides of the cheesecake, make another 1/2 batch of the crumb mixture. Bake the crust in the preheated oven for 8 minutes, then cool slightly. 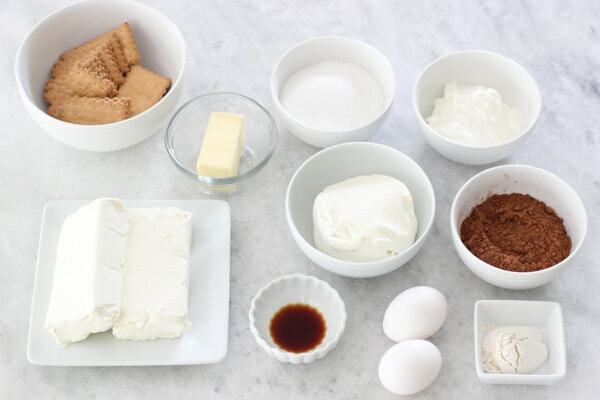 Meanwhile, mix the softened cream cheese with the granulated sugar in a large mixing bowl. 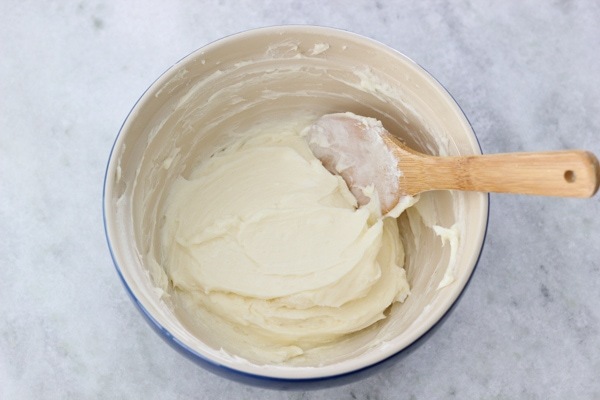 If your cream cheese is softened enough and you’re willing to put your arm muscles to good use, you can use a large wooden spoon, but you can most certainly use a standing mixer or a hand mixer. Mix until smooth. Add the ricotta, sour cream, eggs and vanilla extract. If you would prefer not to use ricotta cheese, you can use the same amount of farmer’s cheese or cream cheese. 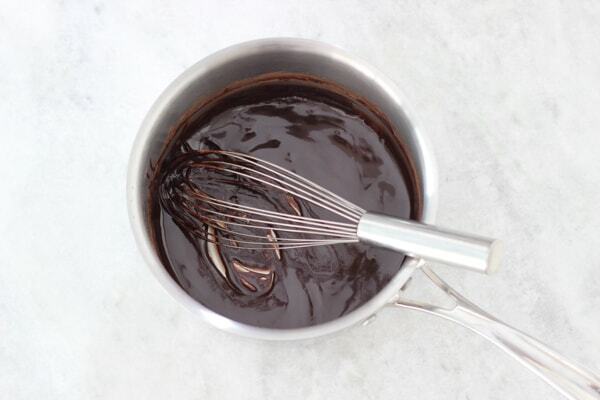 At this point, I like to switch to a whisk. 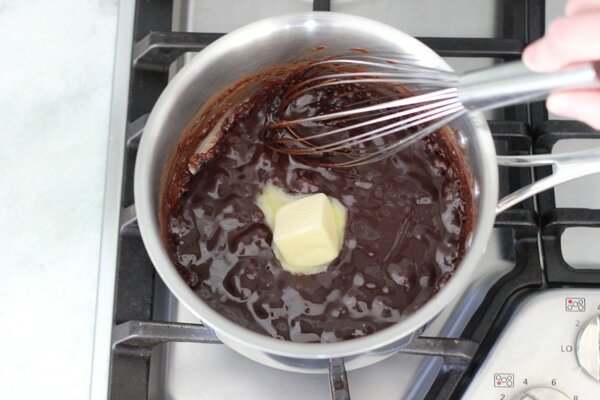 Add the cocoa powder and flour. Mix to combine. Pour the filling into the baking pan over top of the slightly cooled crust. The thing that I’m happiest about right about now is that I only have one bowl, one spoon and one whisk to wash. Bake in the 325 degrees Fahrenheit preheated oven for about 40 minutes. Turn off the oven, crack the oven door open and let the cheesecake cool gradually until the oven is completely cool. Chill the cheesecake in the refrigerator overnight, or for about 6-8 hours. 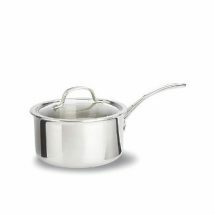 Take the cheesecake out of the springform pan and transfer to a serving plate or a cake pedestal. This glaze/frosting is AMAZING! Something about the addition of sour cream makes it extra creamy and flavorful. I actually prefer it to melted chocolate. You can totally skip making the glaze though. If I’m going with the easiest route possible, I only make the cheesecake itself. 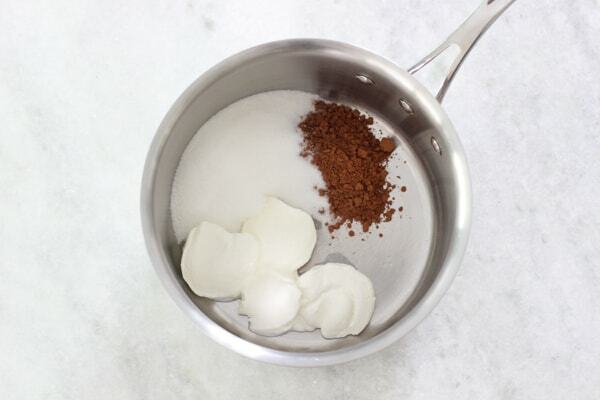 Place the cocoa powder, sour cream and sugar in a small saucepan. 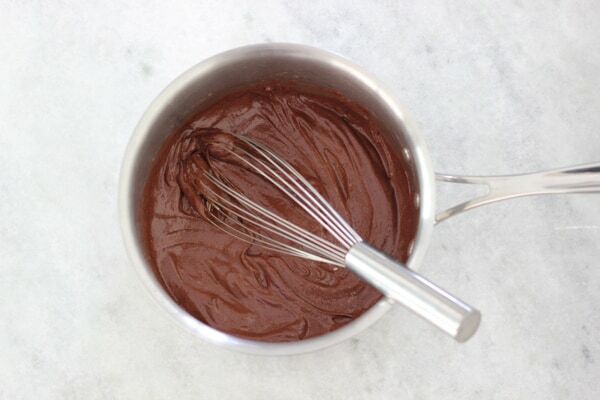 Whisk everything together until smooth while still cold. Cook on medium-low heat until it comes to a boil, simmer for a few minutes, until the sugar dissolves and the glaze thins out to a syrupy consistency. Whisk in the butter. I also spread the glaze on the sides of the cake. 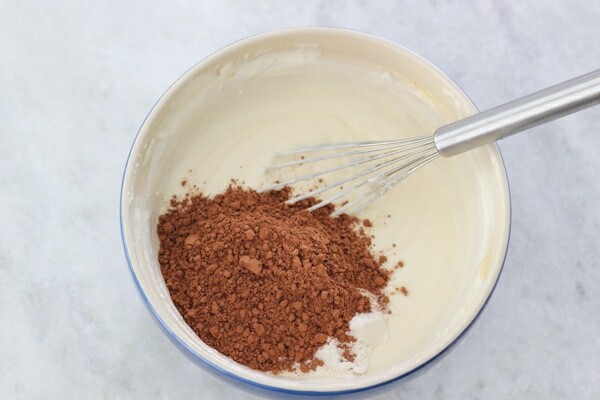 You can make more crumbs and spread them up the sides of the cake. Decorate with raspberries. I also use chopped, toasted nuts, chocolate shavings, sprinkles, etc. In a large ziplock bag, crush the tea biscuits with a rolling pin to get 1 cup of cookie crumbs. You can also use vanilla wafers or graham crackers. You can also pulse the cookies in a food processor. Press the crumb mixture into the bottom of a 9 inch round springform baking pan. Bake the crust in the preheated oven for 8 minutes, then cool slightly. If you want to make your crust come up the sides of the cheesecake, make another ½ batch of the crumb mixture. 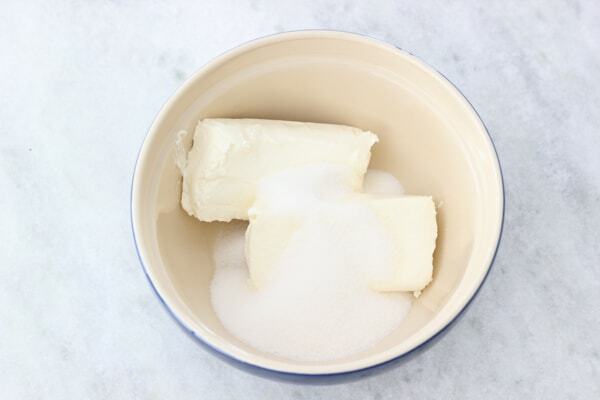 Meanwhile, mix the softened cream cheese with the granulated sugar in a large mixing bowl. 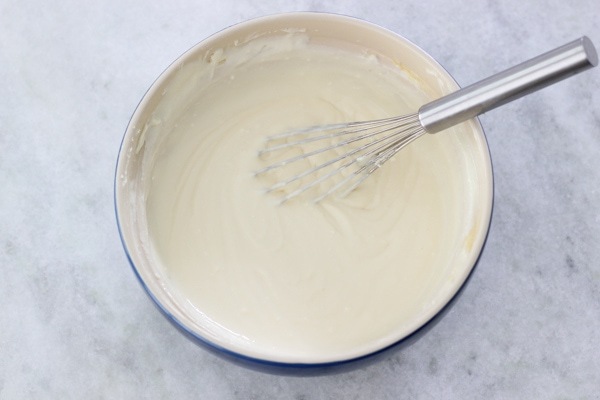 If your cream cheese is softened enough and you're willing to put your arm muscles to good use, you can use a large wooden spoon, but you can most certainly use a standing mixer or a hand mixer. Mix until smooth. 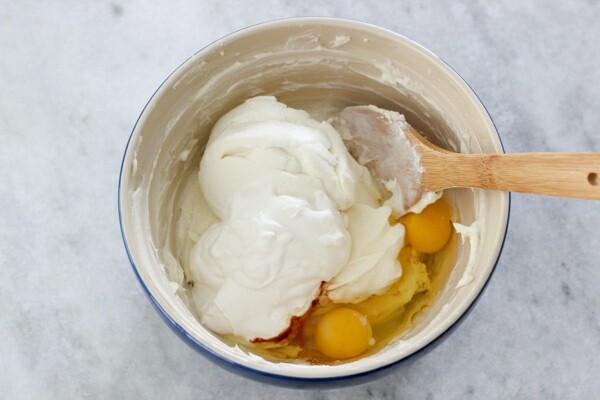 Add the ricotta, sour cream, eggs and vanilla extract. At this point, I like to switch to a whisk. Add the cocoa powder and flour. Mix to combine. Pour the filling into the baking pan over top of the slightly cooled crust. Bake in the 325 degrees Fahrenheit preheated oven for about 40 minutes. Turn off the oven, crack the oven door open and let the cheesecake cool gradually until the oven is completely cool. Chill the cheesecake in the refrigerator overnight, or for about 6-8 hours. 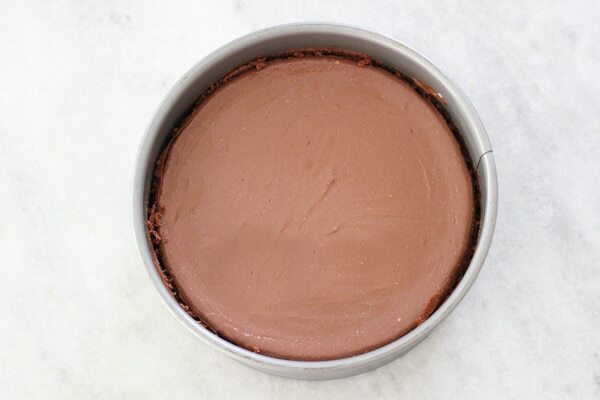 Take the cheesecake out of the springform pan and transfer to a serving plate or a cake pedestal. 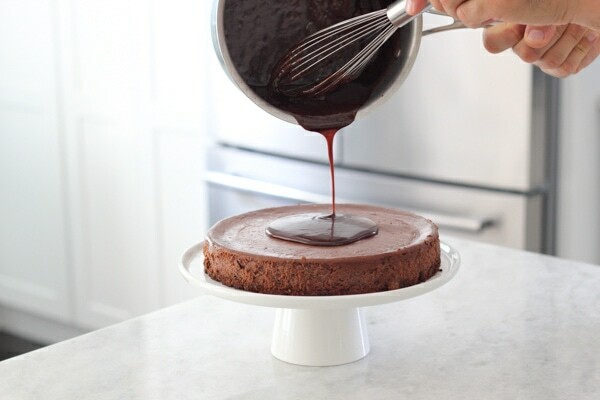 Pour the chocolate glaze over the top of the cheesecake. Quickly tilt the cheesecake while swirling it around to distribute it all over the top. 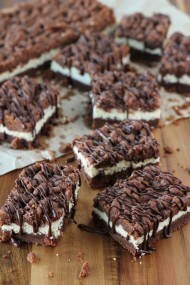 Do this quickly, since the cheesecake is cold and the chocolate glaze will set up fast. I also spread the glaze on the sides of the cake. 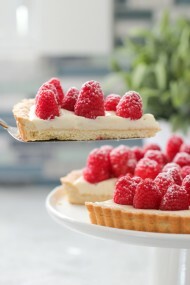 Decorate with raspberries. I also use chopped, toasted nuts, chocolate shavings, sprinkles, etc. Mmmm….that looks very soft, must be delicious! I like easy recipes, need to give it a try. Easy recipes are my favorite. I hope you enjoy the cheesecake, Luba. Wow! That looks Devine! My type of cheesecake! Thank you, Linchara:). Cheesecakes are the best. This looks amazing! Can it be frozen to be eaten later? And if yes, would you freeze with the glaze or without? I’ve never tried freezing it, Nata, so I’m not sure. Oh yummy!!! 😍 I want to make this cake today but don’t have ricotta cheese. Would it make any difference without it? Hi Yelena. I explained all the possible substitutions in the recipe instructions. You can use farmer’s cheese or cream cheese. Just use the same amount as the ricotta. Olga, I love your ricotta cheesecake , I usually make it at least once a month but because I love chocolate this will be my next cake to try! Thank you for sharing it with us!!! I’m so happy to hear that, Tatyana. I hope you enjoy the chocolate version just as much. Hi Olga. 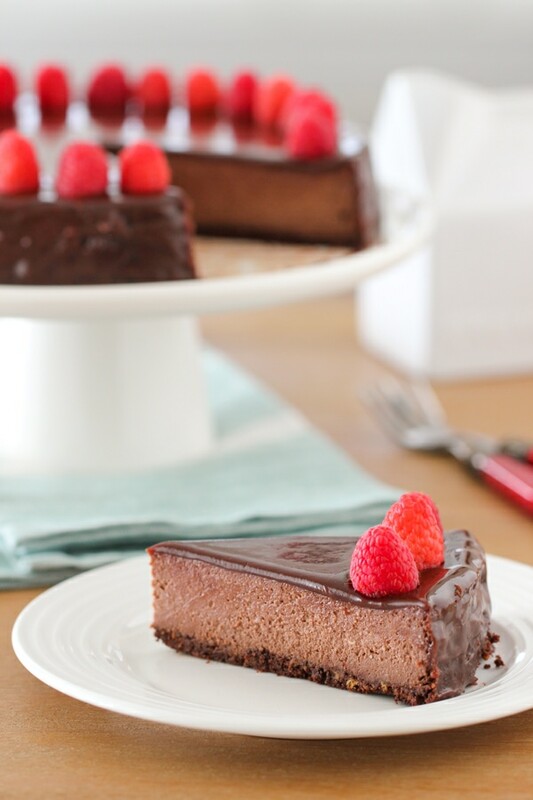 I made this cheesecake last night, and made the chocolate glaze this morning after breakfast (which just happened to be your buttermilk pancakes)… It is so chocolaty and delicious! My kids said that’s the best cheesecake ever! 🙂 Thank you for sharing another scrumptious recipe! That’s awesome, Vita. 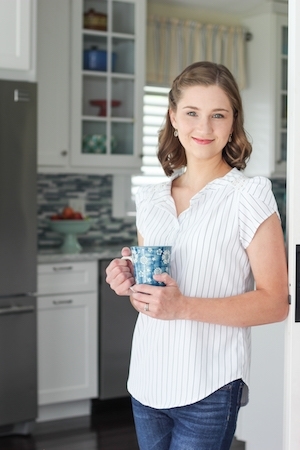 I’m glad you are enjoying the recipes and I really appreciate that you took the time to write. just want to let you know i tried this today and it was perfect! thank you so much! I’m so happy to hear that, Ava. Thank you for letting me know. – Bake the cheesecake in a water bath. Wrap the outside of the cake pan in several layers of aluminum foil, then put it inside a large roasting pan, put it in the oven and then pour about an inch or two of warm water into the roasting pan. – Check the cheesecake in plenty of time before it should finish baking. Ovens are different and bake faster than others. Plus, baking pan are different too. For example, a darker baking pan will cook faster than a light colored one. When you shake the pan, the cheesecake should still jiggle a little in the center. It should be set around the edges, but not be fully set in the center. The cheesecake will continue to bake even after the cheesecake is out of the oven, so you need to turn off the oven while the center is not completely baked through. – Another trick is to turn the oven off and then prop the oven door open and leave the cheesecake in the oven for about 30 minutes, so that it will gradually cool off. 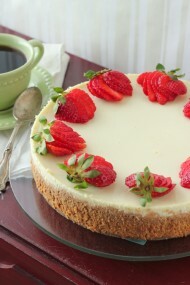 – Make sure the sides of the baking pan are generously greased before pouring in the cheesecake batter. If the cheesecake batter sticks to the sides of the pan and puffs up while baking, it will shrink when cooling, and if the sides aren’t greased enough, the cake will crack when it’s cooling as aren’t able to pull away from the sides of the baking pan. 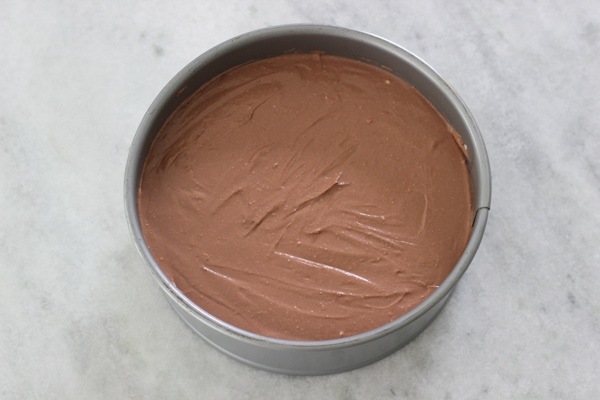 – Cool the cheesecake completely before taking it out of the baking pan. I usually chill it overnight in the refrigerator before serving it. I made this cheesecake yesterday and it was delicious, my family loved it. I must say I was surprised at how chocolatey it tasted considering it had no chocolate in the actual cheesecake, that’s a bonus – less fat = less calories!! I did cut a few corners though and used 225gms chocolate biscuits (cookies) crushed and 80 gms butter melted for the base. 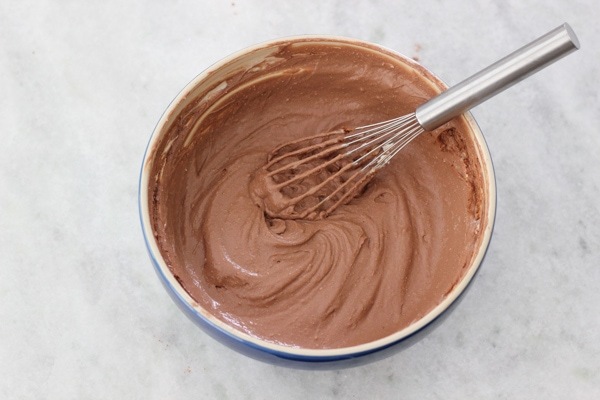 And I made up my favourite ganache/glaze for the top – 150gms dark chocolate and 1/2 cup whipping cream stirred in a saucepan over low heat till melted and combined. Thanks for the recipe Olga, its a “keeper”. I’m so glad you enjoyed it, Christine:). Thank you for sharing. Made this for Shavuot in all the wrong ways: made the whole thing with GF “grahm-style” crackers run through the food processor. Baked it in a tart pan – couldn’t find my springform. Mixed everything through eggs in the food processor, too, and used tvorog. Use GF flour mix from Bob’s. Baked without water bath, and in a toaster of all things, so cooling properly wasn’t an option. The beast cracked like crazy, but was insanely delicious! 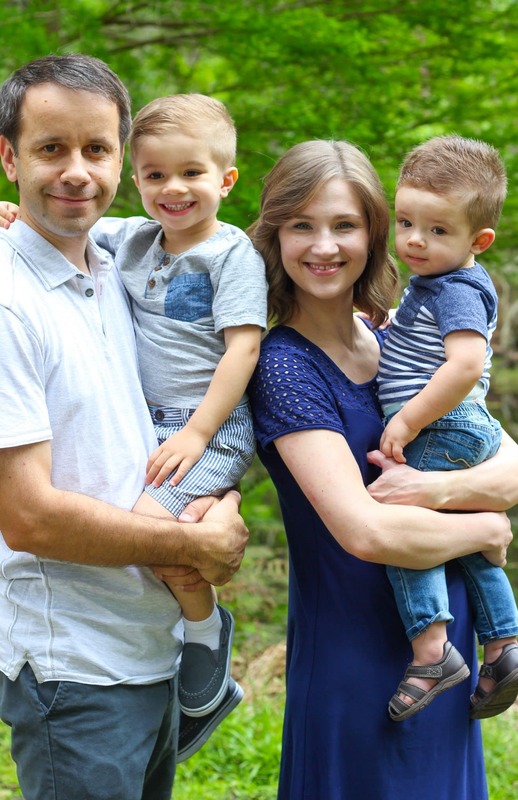 Thank you, Olga! Oh, my! What a dreadful baking experience. You are very strong to persevere. I am so glad that at least it came out tasting good:). Hi Olga, how much in advance can i make this? A day or two in advance would be good, Annya. Hi Olga, I am really enjoying and using your recipes. Thank you! Question – does it matter whipped cream cheese or a block of cream cheese? Thank you! I always use the block cream cheese, Marina. would this still taste as good if i do chocolate ganache on top instead? I’m not sure what you’re asking, Anna. 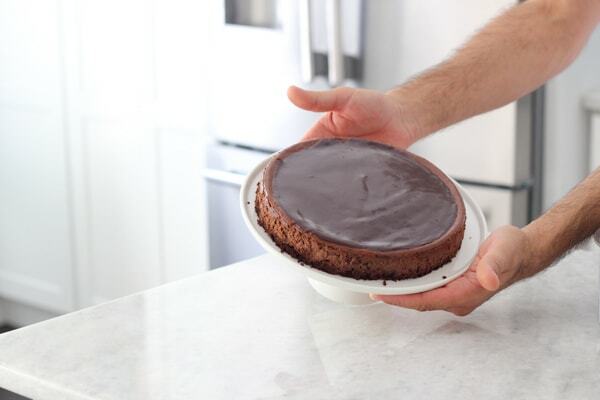 The chocolate ganache is supposed to go on top of the cheesecake.